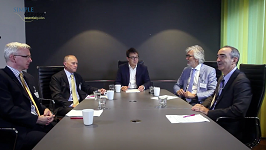 During the "Advances in Coronary Physiology" course in London, (11th September 2017), Simple Education, in association with Radcliffe Cardiology, filmed a roundtable discussion focused around the impact of the SYNTAX II clinical trial results presented at ESC 2017 in Barcelona, Spain. This discussion was moderated by Dr. Justin Davies (London, UK) who was joined by an expert group of physicians including Prof Javier Escaned (Madrid, ES), Prof Amir Lerman (Minnesota, US), Dr Bruce Samuels (Los Angeles, US) and Dr Andrew Sharp (Exeter, UK). The meeting comprised of five panel discussions on a range of topical issues related to the trial results and the use of imaging and physiology. > SESSION 2 / SYNTAX 2 – HOW SHOULD WE INTERPRET THE DATA?